This course will introduce you to methods, techniques and tools for analysing embodied social interaction. 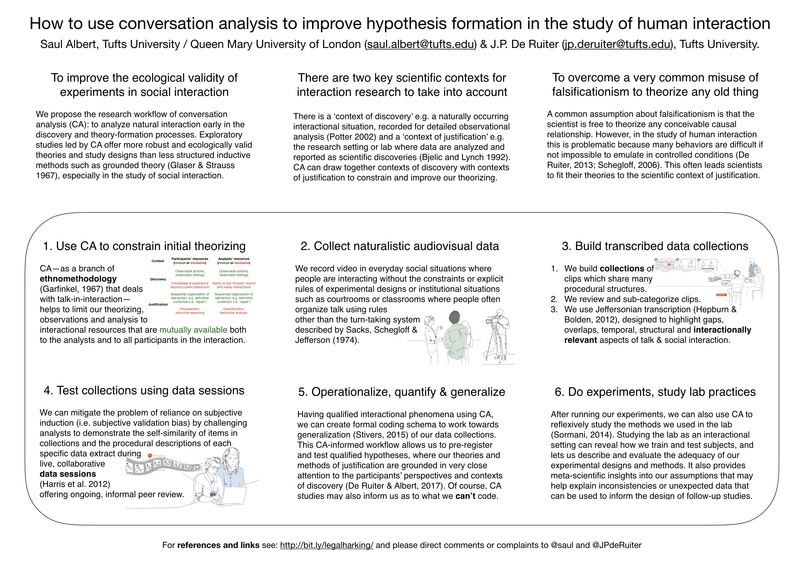 Conversation analytic methods for collecting, transcribing and analysing video data. Drawing techniques for use in field notes and in exploratory data analysis sessions. How to create and use multimodal transcripts for data analysis and presentation of results. Software tools for creating and sharing computer-readable graphical transcriptions. Future directions for multimodal interaction analytics e.g. automation and open science. Can you have a conversation with your TV? As part of the Drawing Interactions project (see report), Pat Healey, Toby Harris, Claude Heath, and Sophie Skach and I ran a workshop at New Developments in Ethnomethodology in London (March 2018) to teach interaction analysts how and why to draw. Ethnomethodological and conversation analytic (EM/CA) studies often use video software for transcription, analysis and presentation, but no such tools are designed specifically for EM/CA. There are, however, many software tools commonly used to support EM/CA research processes (Hepburn & Bolden, 2016 pp. 152-169; Heath, Hindmarsh & Luff 2010 pp. 109-132), all of which adopt one of two major paradigms. On the one hand, horizontal scrolling timeline partition-editors such as ELAN (2017) facilitate the annotation of multiple ‘tiers’ of simultaneous activities. On the other hand, vertical ‘lists of turns’ editors such as CLAN (Macwhinney, 1992) facilitate a digital, media-synced version of Jefferson’s representations of turn-by-turn talk. However, these tools and paradigms were primarily designed to support forms of coding and computational analysis in interaction research that have been anathema to EM/CA approaches (Schegloff 1993). Their assumptions about how video recordings are processed, analyzed and rendered as data may have significant but unexamined consequences for EM/CA research. This 2.5 hour workshop will reflect on the praxeology of video analysis by running a series of activities that involve sharing and discussing diverse EM/CA methods of working with video. Attendees are invited to bring a video they have worked up from ‘raw data’ to publication, which we will re-analyze live using methods drawn from traditions of life drawing and still life. A small development team will build a series of paper and software prototypes over the course of the workshop week, aiming to put participants’ ideas and suggestions into practice. 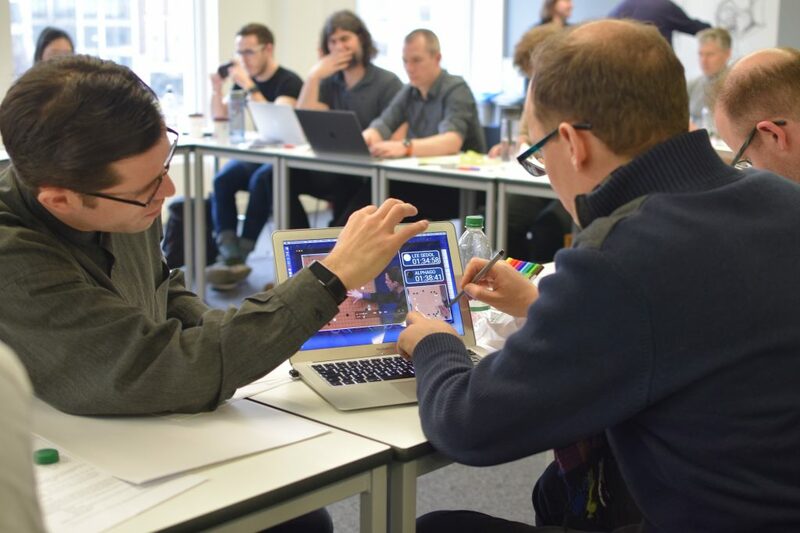 Overall, the workshop aims to inform the ongoing development of software tools designed reflexively to explore, support, and question the ways we use video and software tools in EM/CA research. Heath, C., Hindmarsh, J., & Luff, P. (2010). Video in qualitative research: analysing social interaction in everyday life. London: Sage Publications. Hepburn, A., & Bolden, G. B. (2017). Transcribing for social research. London: Sage. MacWhinney, B. (1992). The CHILDES project: Tools for analyzing talk. Child Language Teaching and Therapy, (2000). Schegloff, E. A. (1993). Reflections on Quantification in the Study of Conversation. Research on Language & Social Interaction, 26(1), 99–128. I’m presenting with Dirk vom Lehn on a panel organized by two fantastic EM/CA scholars Richard Ogden and Leelo Keevalik on ‘non-lexical vocalizations’. We’re using some great video data we collected featuring novice dancers in a Swing Patrol ‘Dance in a Day’ workshop as part of the dance as interaction project. CA studies of assessments as distinct, sequentially organized social actions (Pomerantz, 1984) have tended to define assessments for the purposes of data selection (Ogden, 2006, p. 1758) as “utterances that offer an evaluation of a referent with a clear valence” (Stivers & Rossano, 2010). However, this definition may exclude evaluative practices where the ‘valenced’ terms of assessment are more equivocal. It also obscures how the valences that mark out an utterance as an assessment are produced interactionally in the first place. This paper follows Goodwin & Goodwin’s (1992) proposal that assessment ‘segments’ (words like ‘good’ or ‘beautiful’), and assessment ‘signals’ (vocalizations like “mmm!” or “ugh!”) are organized into sequential ‘slots’ that render both ‘segments’ and ‘signals’ reflexively accountable as evaluative ‘assessment activities’. Data are drawn from recordings of a novice partner dance workshop at moments where teachers’ pro-forma terminal assessments marking the completion of a dance practice session co-occur with students’ evaluative assessment activities. Analysis shows how students use non-lexical vocalizations as evaluative assessments after imitating the bodily-vocal demonstrations (Keevalik, 2014) of the teachers and completing an unfamiliar dance move together. Extract 1 shows one example of these non-lexical vocalizations as dance partners Paul and Mary complete a new dance movement while the teachers call out rhythms and instructions. 14 Tch1: SO: WITH YOUR NE̲W̲ P:̲A̲R̲TNE:⌈:r.
15 Paul: ⌊That's an odd way of descri:bing it. The analysis suggests that non-lexical vocalizations provide a useful resource for evaluating the achievement of as-yet-unfamiliar joint actions and managing and calibrating subtle degrees and dimensions of individual and mutual accountability for troubles encountered in learning a new, unfamiliar partner dance movement. Goodwin, C., & Goodwin, M. H. (1992). Context, activity and participation. In P. Auer & A. D. Luzio, P. Auer & A. D. Luzio (Eds. ), The contextualization of language (pp. 77–100). John Benjamins. Keevallik, L. (2014). Turn organization and bodily-vocal demonstrations. Journal of Pragmatics, 65, 103–120. Ogden, R. (2006). Phonetics and social action in agreements and disagreements. Journal of Pragmatics, 38(10), 1752–1775. Pomerantz, A. (1984). Agreeing and disagreeing with assessments: Some features of preferred/dispreferred turn shapes. In J. M. Atkinson & J. Heritage, (Eds. ), Structures of social action: Studies in conversation analysis (pp. 57–102). Cambridge: Cambridge University Press. Stivers, T., & Rossano, F. (2010). Mobilizing Response. Research on Language & Social Interaction, 43(1), 3–31. Mick Smith and I are organizing this panel on noticings at ICCA 2018. We’re really excited to have submissions from some amazing EM/CA scholars to help us explore this questions of action formation / ascription, embodiment, multiactivity, and reference across at least three languages. Noticings as actions-in-conversation are a ubiquitous, versatile, but under-researched phenomenon (Keisanen, 2012). Schegloff (2007b, p. 218) suggests that noticings “put on offer a line of talk” that renders something optionally relevant for subsequent interaction, although Stivers & Rossano’s (2010) study of the diminished ‘response-relevance’ of noticings leads some analysts to question whether noticings function as social actions (Thompson, Fox, & Couper-Kuhlen, 2015, p. 141) formed from prospectively paired ‘action types’ (Levinson, 2013), or whether they are organised—as Schegloff (2007b, p. 219) suggests—as a generic retro-sequence pointing backwards to a prior ‘noticeable’. Alongside these debates, C. Goodwin & Goodwin (2012) focus on how noticings point “outside of talk”, drawing as-yet-unnoticed resources into embodied social action. Without pre-specifying any one analytic characterization, this panel brings together research explores the ambiguities of noticings as social actions alongside a range of mobile and embodied practices where describing (Sidnell & Barnes, 2009), referring (Hindmarsh & Heath, 2000), and categorizing may also be at issue (Schegloff, 2007a). Alongside empirical studies, contributors also address theoretical questions that arise from treating noticings as conversational devices. How are researchers’ noticings and participants’ noticings differently constitutive of interactional phenomena (Laurier, 2013)? Do noticings emerge reflexively as part of a particular interactional environment and work towards particular interactional ends (Schegloff, 2007a, p. 87 note 17), or are analytic invocations of ‘noticing’ in CA flawed descriptions that obscure more of the action than they clarify? Drawing together diverse approaches to noticings, this panel asks how understanding noticings as actions-in-conversation may open up new empirical and theoretical questions and challenges. Goodwin, C., & Goodwin, M. H. (2012). Car talk: Integrating texts, bodies, and changing landscapes. Semiotica, 191(1/4), 257–286. Hindmarsh, J., & Heath, C. (2000). Embodied reference: A study of deixis in workplace interaction. Journal of Pragmatics, 32(12), 1855–1878. Keisanen, T. (2012). “Uh-oh, we were going there”: Environmentally occasioned noticings of trouble in in-car interaction. Semiotic, 191(1/4), 197–222. Laurier, E. (2013). Noticing: Talk, gestures, movement and objects in video analysis. In R. Lee, N. Castree, R. Kitchin, V. Lawson, A. Paasi, C. Philo, … C. W. Withers (Eds. ), The SAGE Handbook of Human Geography (2nd ed., Vol. 31, pp. 250–272). London: Sage. Levinson, S. C. (2013). Action formation and ascription. In J. Sidnell & T. Stivers (Eds. ), The Handbook of Conversation Analysis (pp. 101–130). Oxford: John Wiley & Sons. Schegloff, E. A. (2007a). A tutorial on membership categorization. Journal of Pragmatics, 39(3), 462–482. Schegloff, E. A. (2007b). Sequence organization in interaction: Volume 1: A primer in conversation analysis, Cambridge: Cambridge University Press. Sidnell, J., & Barnes, R. (2009). Alternative, subsequent descriptions. In J. Sidnell, M. Hayashi, & G. Raymond (Eds. ), Conversational repair and human understanding (pp. 322–342). Cambridge: Cambridge University Press. Thompson, S. A., Fox, B. A., & Couper-Kuhlen, E. (2015). Grammar in everyday talk: Building responsive actions. Cambridge: Cambridge University Press. Here’s the abstract to an ICCA 2018 paper I’m working on with J.P. de Ruiter at the Human Interaction Lab at Tufts. The goal is to use computational linguistic methods (that often use the term ‘backchannel’) to see if all these responsive particles really belong in one big undifferentiated ‘bucket’. Many studies of dialogue use the catch-all term ‘backchannel’ (Yngve ,1970) to refer to a wide range of utterances and behaviors as forms of listener-feedback in interaction. The use of this wide category ignores nearly half a century of research into the highly differentiated interactional functions of ‘continuers’ such as ‘uh huh’ or ‘wow’ (Schegloff, 1982, Goodwin, 1986), acknowledgement tokens such as ‘yeah’, ‘right’ or ‘okay’ (Jefferson, 1984; Beach, 1993) and change-of-state markers such as ‘oh’ or ‘nå’ (Heritage, 1984; Heinemann, 2017). These studies show how participants use responsive particles as fully-fledged, individuated, and distinctive words that do not belong in an undifferentiated functional class of ‘backchannels’ (Sorjonen, 2001). For this paper we use the Conversation Analytic British National Corpus (CABNC) (Albert, L. de Ruiter & J. P. de Ruiter, 2015) – a 4.2M word corpus featuring audio recordings of interaction from a wide variety of everyday settings that facilitates ‘crowdsourced’ incremental improvements and multi-annotator coding. We use Bayesian model comparison to evaluate the relative predictive performance of two competing models. In the first of these, all ‘backchannels’ imply the same amount of floor-yielding, while the second CA informed model assumes that different response tokens are more or less effective in ushering extended turns or sequences to a close. We argue that using large corpora together with statistical models can also identify candidate ‘deviant cases’, providing new angles and opportunities for ongoing detailed, inductive conversation analysis. We discuss the methodological implications of using “big data” with CA, and suggest key guidelines and common pitfalls for researchers using large corpora and statistical methods at the interface between CA and cognitive psychology (De Ruiter & Albert, 2017). References (including references for the final talk – which has many more references than this abstract). Albert, S., & De Ruiter, J.P. (2018, in press), Ecological grounding in interaction research. Collabra: Psychology. Beach, W. A. (1990). Searching for universal features of conversation. Research on Language &amp; Social Interaction, 24(1–4), 351–368. Hayashi, M., & Yoon, K. (2009). Negotiating boundaries in talk. Conversation Analysis: Comparative Perspectives, 27, 250. Heritage, J. (1984). A change-of-state token and aspects of its sequential placement. In M. Atkinson & J. Heritage, M. Atkinson & J. Heritage (Eds. ), Structures of social action: Studies in conversation analysis (pp. 299–345). Cambridge: Cambridge University Press. Heritage, J. (2002). Oh-prefaced responses to assessments: A method of modifying agreement/disagreement. In C. E. Ford, B. A. Fox, & S. A. Thompson, C. E. Ford, B. A. Fox, & S. A. Thompson (Eds. ), The Language of Turn and Sequence (pp. 1–28). New York: Oxford University Press. Hoey, E. M., & Kendrick, K. H. (2017). Conversation Analysis. In A. M. B. de Groot & P.Hagoort, A. M. B. de Groot & P.Hagoort (Eds. ), Research Methods in Psycholinguistics: A Practical Guide (pp. 151–173). Hoboken, NJ: WileyBlackwell. Jefferson, G. (1981). On the Articulation of Topic in Conversation. Final Report. London: Social Science Research Council. Ochs, E. (1979). Transcription as theory. In E. Ochs & B. B. Schieffelin, E. Ochs & B. B. Schieffelin (Eds. ), Developmental pragmatics (pp. 43–72). New York: Academic Press. Potter, J., & te Molder, H. (2005). Talking cognition: Mapping and making the terrain. In J. Potter & D. Edwards, J. Potter & D. Edwards (Eds. ), Conversation and cognition (pp. 1–54). Sacks, H. (1963). Sociological description. Berkeley Journal of Sociology, 1–16. Schegloff, E. A. (1982). Discourse as an interactional achievement: Some uses of ?uh huh?and other things that come between sentences. In D. Tannen, D. Tannen (Ed. ), Analyzing discourse: Text and talk (pp. 71–93). Georgetown University Press. Schegloff, E. A. (2007). Sequence organization in interaction: Volume 1: A primer in conversation analysis. Cambridge: Cambridge University Press. Rühlemann (2017). Integrating Corpus-Linguistic and Conversation-Analytic Transcription in XML: The Case of Backchannels and Overlap in Storytelling Interaction. Corpus Pragmatics, 1(3), 201–232. Rühlemann, C., & Gee, M. (2018). Conversation Analysis and the XML method. Gesprächsforschung–Online-Zeitschrift Zur Verbalen Interaktion, 18. Wittenburg, P., Brugman, H., Russel, A., Klassmann, A., & Sloetjes, H. (2006). ELAN: a professional framework for multimodality research. In 5th International Conference on Language Resources and Evaluation (LREC 2006) (pp. 1556–1559). I’ve been teaching EM/CA at Berklee School of Music which has been a delight, and the students are often transcribing situations that involve music, dance, performance, composition and other settings where it’s equally important to transcribe talk and bodily action. What I’ve tried to show them is how to do transcripts that allow them to shift between turn-by-turn action and simultaneous, multi-activity interactions. Lorenza Mondada’s presentation on the differences between types of transcription software has a great explanation of the two basic transcription paradigms (partition-based, horizontally scrolling editors and turn-by-turn, vertically scrolling editors) and what they are most useful for. I wanted to teach my students to use both paradigms and to be able to switch between them so I made this little how-to video. To follow along with this tutorial you’ll need two files: a small clip from “Game Night”(many thanks to Prof. Cecelia Ford for letting me use her often-cited CA data for this tutorial), and Game_Night.cha – the accompanying CLAN transcription file. They’re both zipped up together in this downloadable folder. You only get a tiny clip of the whole Game_Night.mov video file here. The idea of this tutorial is that you can use this as a starting point and then replace the video with your own data. Here’s the youtube video. It was recorded for my Berklee students, so not all parts of it (especially where I refer to the data you’ll have available to you) are relevant to this blog tutorial. We’re contributing this talk to Josh Raclaw‘s panel at the AAA 2017 Toward a transdisciplinary coalition in sociocultural linguistics: A collaborative analysis of presidential discourse in Trump’s Black History Month Listening Session. The panel invites scholars from a variety of methodological orientations to address the same bit of data. Our EM/CA-oriented contribution to the panel focuses on the greeting sequences in the first few moments of the meeting. This paper is designed as a contribution to an inter- and trans-disciplinary panel investigating President Donald Trump’s Black History Month Listening Session. Here we adopt the theory and method of conversation analysis (CA) to examine the first minute of this multiparty interaction—from Trump’s entrance into the room, to the launch of his prepared remarks. Greetings and other phenomena that occur during interactional openings have been widely studied from a conversation-analytic perspective (see, e.g., Schegloff, 1968), and yet here we see them occurring in a very particular institutionalized setting, with very particular participants, and in the presence of an overhearing audience (i.e., at-home viewers). In this paper, our aim is to unpack Trump’s initial interactions with those present in the room: whom does he greet, and in what ways, and how is he greeted in return? Moreover, we ask how these greeting practices contribute to the business of “‘doing being’ president” (cf. Sacks, 1984), and thus we will discuss the various membership categories (Sacks, 1992) that are made relevant in and through these brief introductory exchanges. Our analysis therefore offers insights not only into this specific individual’s interactional style and this particular setting, but also into how greetings operate more broadly in multiparty discourse of this sort. Albert, E. (1964). “Rhetoric,” “logic,” and “poetics” in Burundi: culture patterning of speech behavior. American Anthropologist, 66, pt 2(6), 35-54. Billig, Michael. (1999a). Conversation Analysis and the claims of naivety. Discourse & Society, 10(4), 572-576. Billig, Michael. (1999b). Whose terms? Whose ordinariness? Rhetoric and ideology in Conversation Analysis. Discourse & Society, 10(4), 543-582. Bolinger, Dwight. (1961). Contrastive Accent and Contrastive stress. Language, 37, 83-96. Clayman, Steven E., & Heritage, John. (2002). The News Interview: Journalists and Public Figures on the Air. Cambridge, England: Cambridge University Press. Clift, Rebecca, & Raymond, Chase Wesley. (2018). Actions in practice: On details in collections. Discourse Studies. Couper-Kuhlen, Elizabeth. (1984). A new look at contrastive intonation. In R. J. Watts & Urs Weidmann (Eds. ), Modes of Interpretation: Essays presented to Ernst Leisi on the occasion of his 65th birthday (pp. 137-158). Tübingen: Gunter Narr. Couper-Kuhlen, Elizabeth, & Thompson, Sandra A. (2005). A linguistic practice for retracting overstatements: ‘Concessive repair’. In Auli Hakulinen & Margret Selting (Eds. ), Syntax and Lexis in Conversation: Studies on the use of linguistic resources in talk-in-interaction (pp. 257-288). Amsterdam: John Benjamins. Drew, Paul, & Heritage, John. (1992). Analyzing Talk at Work: An Introduction. In Paul Drew & John Heritage (Eds. ), Talk at Work (pp. 3-65). Cambridge: Cambridge University Press. Heritage, John. (1984). Garfinkel and Ethnomethodology. Cambridge, UK: Polity Press. Heritage, John, & Clayman, Steven E. (2010). Talk in Action: Interactions, Identities and Institutions. Oxford: Blackwell-Wiley. Hough, Emerson. (1917). The man next door. New York: D. Appleton and Company. Hansen, A. D. (2005). A practical task: Ethnicity as a resource in social interaction. Research on Language and Social Interaction, 38(1), 63-104. Jefferson, Gail. (1978). What’s In a ‘Nyem’? Sociology, 12, 1, 135-139. Jefferson, Gail. (1981). The Abominable ‘Ne?’: A Working Paper Exploring the Phenomenon of Post-Response Pursuit of Response. Occasional Paper No.6, Department of Sociology,: University of Manchester, Manchester, England. Jefferson, G. (1989). Letter to the editor re: Anita Pomerantz’ epilogue to the special issue on sequential organization of conversational activities. Western Journal of Speech Communication, 53, 427-429. Kendon, Adam. (1990). Spatial Organization in Social Encounters: The F-Formation System. In Adam Kendon (Ed. ), Conducting Interaction: Patterns of Behavior in Focused Encounters (pp. 209-238). Cambridge: Cambridge University Press. Pomerantz, Anita M. (1984a). Agreeing and Disagreeing with Assessments: Some Features of Preferred/Dispreferred Turn Shapes. In J. Maxwell Atkinson & John Heritage (Eds. ), Structures of Social Action: Studies in Conversation Analysis (pp. 57-101). Cambridge, UK: Cambridge University Press. Pomerantz, Anita M. (1984b). Pursuing a Response. In J. Maxwell Atkinson & John Heritage (Eds. ), Structures of Social Action (pp. 152-164). Cambridge: Cambridge University Press. Raymond, Chase Wesley. (2017). Indexing a contrast: The ‘do’-construction in English conversation. Journal of Pragmatics, 118, 22-37. Raymond, Chase Wesley. (Frth). Category accounts: Normativity in sequences of action. Language in Society. Raymond, Chase Wesley, & Stivers, Tanya. (2016). The omnirelevance of accountability: Off-record account solicitations. In Jeffrey D. Robinson (Ed. 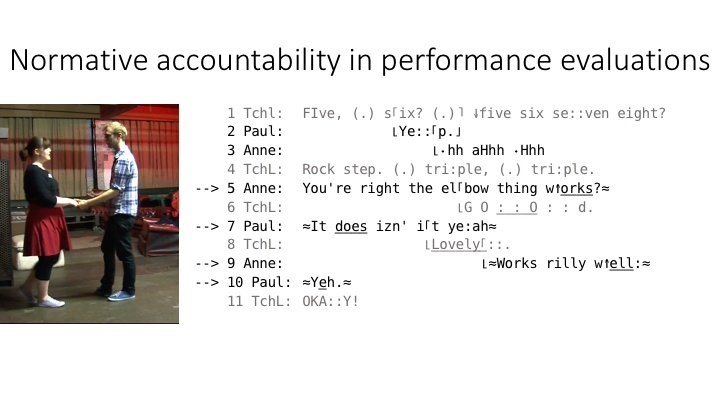 ), Accountability in Social Interaction (pp. 321-353). Oxford: Oxford University Press. Raymond, Geoffrey. (2018). Which epistemics? Whose conversation analysis? Discourse Studies. Rossano, Federico. (2009). Gase as a method of pursuing responses. Paper presented at the Annual Meets of the American Sociological Association, San Franciso. Rossano, Federico. (2013). Gaze in Social Interaction. In Jack Sidnell & Tanya Stivers (Eds. ), The Handbook of Conversation Analysis (pp. 308-329). Malden, MA: Wiley-Blackwell. Sacks, Harvey. (1984). Notes on Methodology. In J. M. Atkinson & J. Heritage (Eds. ), Structures of Social Action (pp. 21-27). Cambridge: Cambridge University Press. (Edited by Gail Jefferson from various lectures). Sacks, Harvey. (1987 ). On the Preferences for Agreement and Contiguity in Sequences in Conversation. In Graham Button & John R. E. Lee (Eds. ), Talk and Social Organisation (pp. 54-69). Clevedon, England: Multilingual Matters. Sacks, Harvey. (1992). Lectures on Conversation (2 vols.). Oxford: Blackwell. Sacks, Harvey, Schegloff, Emanuel A., & Jefferson, Gail. (1974). A Simplest Systematics for the Organization of Turn-Taking for Conversation. Language, 50, 696-735. Schegloff, Emanuel A. (1968). Sequencing in Conversational Openings. American Anthropologist, 70, 1075-1095. Schegloff, Emanuel A. (1987a). Analyzing Single Episodes of Interaction: An Exercise in Conversation Analysis. Social Psychology Quarterly, 50(2), 101-114. Schegloff, Emanuel A. (1987b). Between Macro and Micro: Contexts and Other Connections. In Jeffrey C. Alexander, Bernhard Giesen, Richard Münch, & Neil J. Smelser (Eds. ), The Micro-Macro Link (pp. 207-234). Berkeley: University of California Press. Schegloff, Emanuel A. (1997a). Practices and Actions: Boundary Cases of Other-Initiated Repair. Discourse Processes, 23(3), 499-545. Schegloff, Emanuel A. (1997b). Whose Text? Whose Context. Discourse & Society, 8(2), 165-187. Schegloff, Emanuel A. (1998). Reply to Wetherell. Discourse and Society, 9(3), 457-460. Schegloff, Emanuel A. (1999a). Discourse, Pragmatics, Conversation, Analysis. Discourse Studies, 1(4), 405-435. Schegloff, Emanuel A. (1999b). ‘Schegloff’s Texts’ as ‘Billig’s Data’: A Critical Reply to Billig. Discourse and Society, 10(4), 558-572. Schegloff, Emanuel A. (2007). Sequence organization in Interaction: A Primer in Conversation Analysis Volume 1. Cambridge: Cambridge University Press. Schegloff, Emanuel A., & Sacks, Harvey. (1973). Opening Up Closings. Semiotica, 8(4), 289-327. Stivers, Tanya. (2005). Modified Repeats: One Method for Asserting Primary Rights from Second Position. Research on Language and Social Interaction, 38(2), 131-158. Stivers, Tanya, & Rossano, Federico. (2010). Mobilizing Response. Research on Language and Social Interaction, 43, 3-31. Here these are the references for my talk on terminal assessments and performance evaluations in a partner dance workshop at LANSI 2017. A slide showing some of the normative dimensions of accountability that emerge through students’ terminal performance evaluations and how they’re involved in teachers’ routine, terminal assessments. Garfinkel, H. (1967). Studies in ethnomethodology. America. Englewood Cliffs, New Jersey: Prentice-Halll. Goodwin, C., & Goodwin, M. H. (1992). Assessments and the construction of context. In C. Goodwin & A. Duranti, C. Goodwin & A. Duranti (Eds. ), Rethinking context: Language as an Interactive Phenomenon (Vol. 11, pp. 147–189). Cambridge: Cambridge University Pressess. Harness Goodwin, M., & Goodwin, C. (1986). Gesture and coparticipation in the activity of searching for a word. Semiotica, 62(1–2), 51–75. Keevallik, L. (2013). Here in time and space: Decomposing movement in dance instruction. In P. Haddington, L. Mondada, & M. Nevile, P. Haddington, L. Mondada, & M. Nevile (Eds. ), Interaction and Mobility: Language and the Body in Motion (pp. 345–370). Berlin/Boston: Walter de Gruyter. Pomerantz, A. (1984). Agreeing and disagreeing with assessments: Some features of preferred/dispreferred turn shapes. In J. M. Atkinson & J. Heritage, J. M. Atkinson & J. Heritage (Eds. ), Structures of social action: Studies in conversation analysis (pp. 57–102). Cambridge: Cambridge University Press. Schütz, A. (1951). Making music together: A study in social relationship. Social Research, 18(1), 76–97. Thompson, S. A., Fox, B. A., & Couper-Kuhlen, E. (2015). Grammar in Everyday Talk: Building Responsive Actions. Cambridge: Cambridge University Press,. Wittgenstein, L. (1967). Lectures and conversations on Aesthetics, Psychology and Religious Belief. (C. Barrett, C. Barrett, Ed.). Berkeley and Los Angeles: University of California Press. Our 2017 CogSci paper argues that conversation analysis (CA), when used at the right point in the experimental research cycle, can provide all the benefits of HARKing with none of the harms. Bjelic, D., and Lynch, M. (1992). The Work of a (Scientific) Demonstration: Respecifying Newton’s and Goethe’s Theories of Prismatic Color. In Watson, G. and Seiler, R.Text in Context: Contributions to Ethnomethodology, 52–78. Sage Publications Newbury Park, CA. De Ruiter, J. P. (2013). Methodological paradigms in interaction research. In Alignment in Communication: Towards a New Theory of Communication, in Wachsmuth, I, De Ruiter, J. P. Jaecks, P, and Kopp, S (Eds. ), John Benjamins Publishing Company. De Ruiter, J. P., and Albert, S. (2017). An Appeal for a Methodological Fusion of Conversation Analysis and Experimental Psychology. Research on Language and Social Interaction, 50(1), 90-107. Garfinkel, Harold. 1967. Studies in ethnomethodology. Englewood Cliffs, New Jersey: Prentice-Halll. Glaser, G., and Strauss, A. (1967). The Discovery of Grounded Theory: Strategies for Qualitative Research. New York, NY: Aldine de Gruyter. Hepburn, A, and Bolden, B. (2012). The Conversation Analytic Approach to Transcription. In Sidnell, J and Stivers, T (Eds.) The Handbook of Conversation Analysis,, 57–76. Oxford: John Wiley & Sons. Harris, J., Theobald, M., Danby, S., Reynolds, E., and Rintel, S. (2012). What’s going on here? The pedagogy of a data analysis session. In Lee, A., and Danby, S. (Eds.) Reshaping Doctoral Education: International Approaches and Pedagogies, 83–96. London: Routledge. Potter, J. (2002). Two Kinds of Natural. Discourse Studies 4(4), 539–42. Sacks, H., Schegloff, E., and Jefferson, G. (1974). A simplest systematics for the organization of turn-taking for conversation. Language 50(4), 696–735. Sormani, P. (2014). Respecifying lab ethnography: an ethnomethodological study of experimental physics. Farnham: Ashgate Publishing, Ltd.
Stivers, T. (2015). Coding Social Interaction: A Heretical Approach in Conversation Analysis? Research on Language and Social Interaction 48 (1). 1–19.